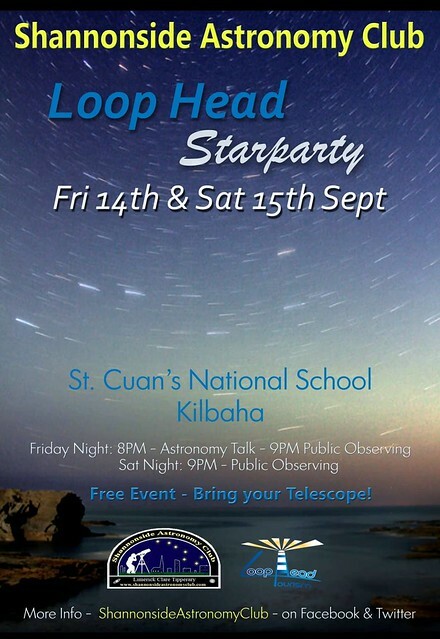 Very excited to announce SAC are holding our annual starparty this year on the beautiful and dark Loop Head peninsula! We will be observing 2 nights over the weekend at St. Cluan's N.S. Kilbaha. Just 20 min from the seaside town of Kilkee, SAC club members will be staying there and driving out to the observing site in the evenings. St. Cluan's NS have kindly offered the use of the 2 large playgrounds for the weekend which have excellent options for observing orientation. There is an abundance of local accommodation in Kilkee, Kilbaha, Carrigaholt and surrounding areas with great deals for group rentals. So if you fancy a trip 'Out Whest' to sample the dark skies at Loop head - Register below now!